Can you feel it? Can you feel the excitement as we wind up to the big finale of the 12 Days of Color?? I can! Well, excitement and a sense of accomplishment (and relief!) may be more like it! I am looking forward to packing up the prizes and sending them out for sure! Some of you have been asking what I will be doing with the blocks when I am done. To be honest, I am not sure. I probably will make some of them into quilts to donate or sell for charity. My daughter was checking out the Wee Wonder prints with great interest, so I may make something from that for her. We’ll see as time goes on. Maybe I will have another giveaway and give a bunch of the blocks away. I do plan on taking some pictures with all of the blocks together in groups so you can get an idea of the overall impression they make. That should be fun! Okay onto today’s block. This one is called Stairway and it is by the amazing Allison Harris of Cluck Cluck Sew. Her interview with Pat Sloan is here, and the directions to her block are here. I loved the simplicity of this block. After all of the star ” type” blocks, I was ready for this simple little rail fence variation. And I had fun with the colors…again! You know the drill by now! Go ahead and comment on the blocks, the fabrics, the threads, your hopes for the New Year, what you’re snacking on right now, etc….A comment a day makes you eligible for the daily small packs and the big prizes at the end as well! Hey I like surprises! !! Now the blue/white made me happy! !! Love this pattern!! Hope you had a very Merry Christmas…and are planning a safe & Happy New Year! I’m still trying to decide which cotton solids I want to add to my stash. Stairway looks great with that grunge by moda. Blue is my favorite color, so I’m really liking that look. Can’t sleep, so here I am checking out what’s going on in the quilting world. Ya it’s all good. I like these blocks – simple but really effective! I will be sad when 12 days are finished but look forward to seeing what you do make with them all! You made my head spin this morning with the new blocks. I love the softness of the ‘rail’. They were all wonderful! Since my birthstone is the beautiful blue sapphire, the blue and white along with the thread captured my heart, even after growing up being made to wear blue to ‘bring out my eyes’ :-). I still love the Grunge, it’s my youth and rebellious side. I’m a little angry at my self from yesterday, making my short post with a migraine, set my ipad down before posting and there she sat until this morning, arrggh. I like them all but the True Colors blocks really stands out. Happy New Year. Today’s Blue and White block is very striking. I like simple. I’m liking the blue and white today, it looks really great in this block. What a great block – I like all four versions! Love the blue and white block. At this point I would say that the grand prize is a surprise and leave it at that. I’m sure whoever wins the grand prize will be very happy, so pictures are not really that important. I like simple blocks like that. You can do so much with how it appears by the colors, shades and prints used. I love the block pattern, and how you can arrange the colors so it can look planned or just random! In still in love with the Kona and Grunge blocks! I can’t wait to see the set of each put together. I’m determined to try a solid quilt this year! Thanks for all of the inspiration. HI, REALLY LIKE THE BLUE+WHITE BLOCK! I just found your blog while I was visiting Missouri Mel’s blog. All of your blocks are wonderful. 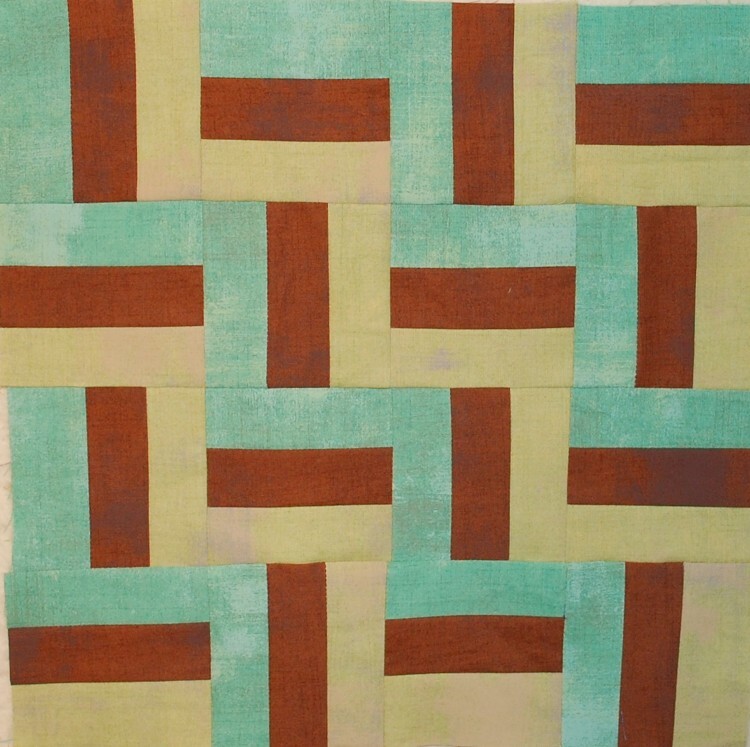 Loving the 3D look of the Grunge block….great colors! Again my favorite is the blue and white. If I had to pick a favorite, I would say that I really enjoy the Blue and White by Michael Miller. I did a rail fence quilt as my very first quilt. It is so much fun to look through yours. I love the Aurfil threads and am jealous that you got so much done. I’m enjoying this! Loved the blues and grunge again today. The planned vs. random was fun to note, too. Love the T’s. They don’t jump out at you until you point them out. My son Theo would love a whole quilt of T’s. I really like the Kona blues. Made a twin quilt for a grand daughter using blocks of tan, aqua and black, rotating them so they formed a chevron. It is a gorgeous quilt and since she picked out the fabrics, just what she wanted. Thanks. The Kona and Grunge have always been my favorite blocks. However, today I am liking the True Colors block the best. I love the way the “T’s” stand out in this block. I can’t believe you are almost at the end. I am going to miss visiting your blog every day and seeing all the blocks that you make. But I would love to see a quilt that you make from them. Have a great day! I love the blue aurifill thread and that blue and white block is gorgeous. Great block.My fav is true colors.HAPPY NEW YEAR! I love the dimension you created with the dark fabrics in the Michael Miller and Grunge collections. Thanks again for sharing. I’m looking forward to the photo of all of the blocks together! This Aurifil would look great with that aqua I was swooning over a few posts ago…. Love. Love the thread! Happy New Year!! Love love love this block! I love being the only one at work so I can read blogs all day. Interesting, I seem to be drawn to different blocks each day! the blue and white solids is fab, as is the True Colors AMH. 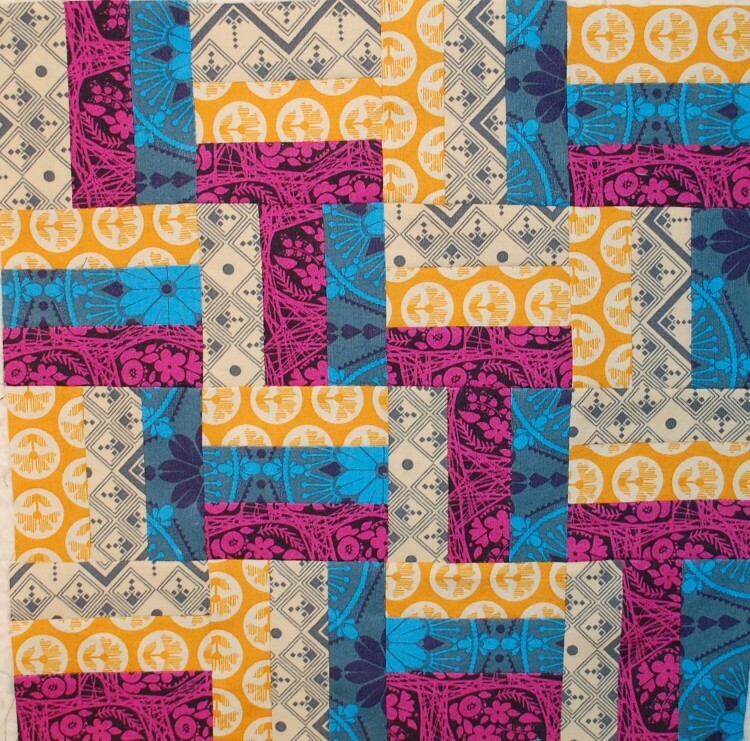 I love the T’s, and the Kona could be fabulous as a whole randomized quilt top. But when I squint my eyes, I can really see that Grunge block too…….. 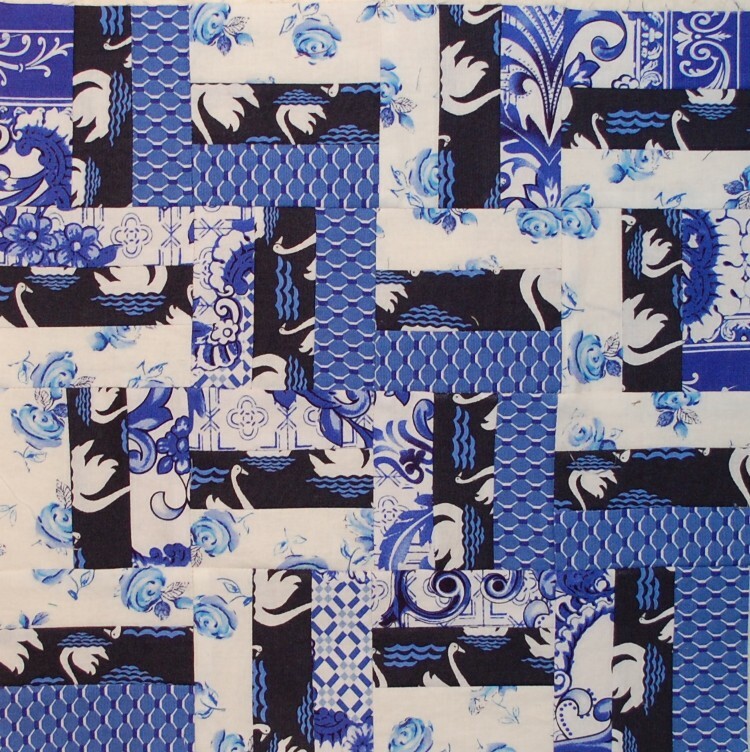 I love the Blue and White Michael Miller….and I could always use more thread!! Love your color choices in the Kona block! Happy New Year! Oohhh, those thread colors are perfect for my next upcoming project. Very cool. Love the blue and white from michael miller. Aurifil 2780 will really enhance that block! Cool blocks. Just got back from dinner with all the kids and grands at our favorite restaurant in Little Italy and members only night at the aquarium in Baltimore – the ONLY way to see the aquarium as far as I’m concerned. Hope you have a wonderful new year. Thanks for the giveaway. I love both the kona and grunge this time;not so keen on the prints though. Love all of them as usual! I have a cup of Apple & Cinnamon tea from Stash in my mug. Have spent the day knitting on my Temperature scarf. Sure did have to use some ‘cold’ colours for this month. Was supposed to spend New Years with friends, but he had a heart attack on Christmas day, so I think we are staying home and leaving him to a quiet recovery day. Prehaps I’ll dig out some stored blocks and put together a comfort quilt for him…. LOVE the True Colors from Free Spirit; it is stunning! The others didn’t send me like me the True Colors did. is another day!! And it’s New Year’s Eve!! The blue and white block is the best looks like scales! Love the fabric choices! Happy New Years! Picture of prizes – he he he!! I just imagine the stack getting bigger and bigger every time you say that! Oh those AMH True Colors make one beautiful block! I like the Kona fabrics for this block. That blue Aurifil thread just gleams- it would look wonderful on that blue and white Michael Miller block. I’m so excited that one of my granddaughters is learning to sew! She is 9 and really getting into it! She’s made several pillow cases for Christmas presents and was so tickled. Sewing is such a wonderful thing to share! Grunge and True Colors are my favorites. The T pattern really shows up nice in the True Colors. I love the aqua Grunge. I didn’t realize there were so many Grunge colors. I love this block, especially the Kona and Grunge ones. Good job, as always! I’d love to see pictures of the blocks all together when this is all over (especially the Grunge!). I gotta say I liked Allison’s block so much on this one! just beautiful”. And again, the colors of the Aurafil – stunning! It’s all good! I don’t like every thing I see either…and that’s okay! 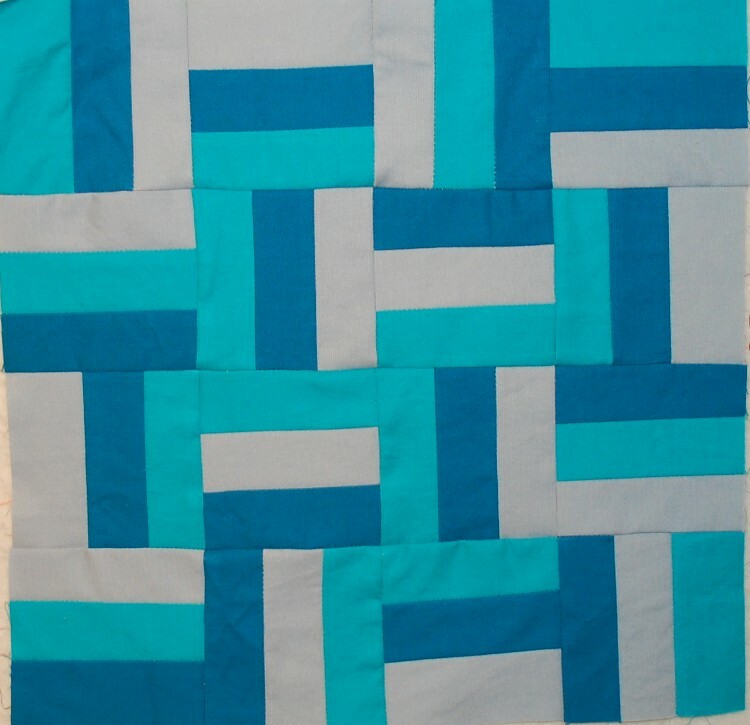 Actually I didn’t like this block at all, but the blue and white would work for me in a quilt with just stairway blocks. Love this block! Love how simple yet powerful this design can be. Thanks for sharing Scott! i love the thread colours, especially the blue. Happy New year to you. Love the Kona colors and the and the Anna Maria Horner True Colors! Great blocks, it will be fun to see some of these together when you play with them. Happy New Year, hope you are celebrating tonight! I love using Aurifil threads! The 50# thread virtually disappears in the seams! Using Aurifil always guarantees me a very accurate 1/4″ seam. Another great day. Love the blue and white snd of course the Grunge block. It would be great to see all the blocks from their lines together. Great job! Love this in True Colors! I’m surprised by how much I really like every one of the blocks this time. Maybe it’s the simplicity of the pattern that speaks to me. Can’t go wrong with a rail fence block. AMH never disappoints. I love that True Colors block. I love the use of the rail fence block – it shows off all of these fabrics so well! It’s interesting to see the different effects achieved by using controlled/ random placement of the strips. I like the detail shown in Anna’s fabrics. 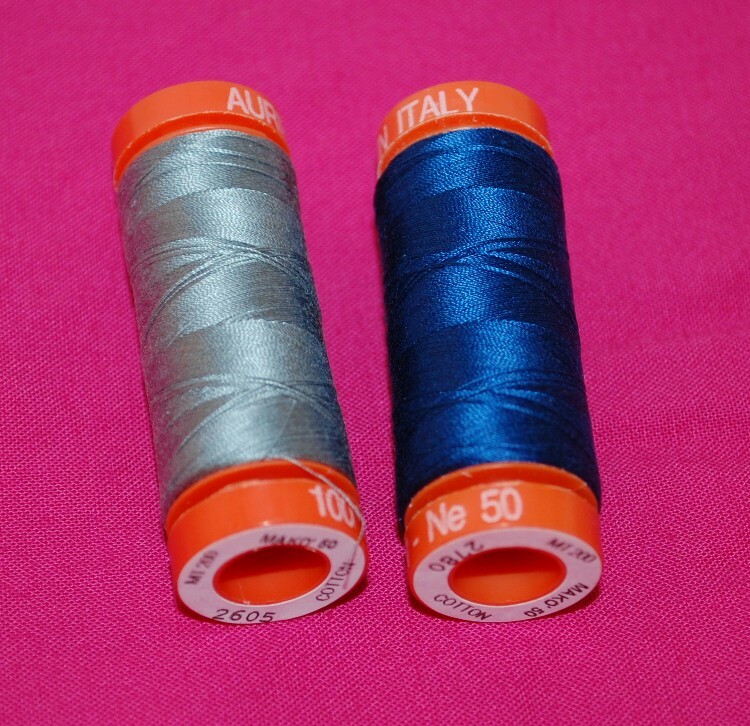 How many blue threads does Aurifil have? Linda, I don’t know for sure how many blues Aurifil has. I have an older card and I counted 34, but I am sure there are more by now! I love the blue and gray threads. I am drinking some sparkling cider at the moment.